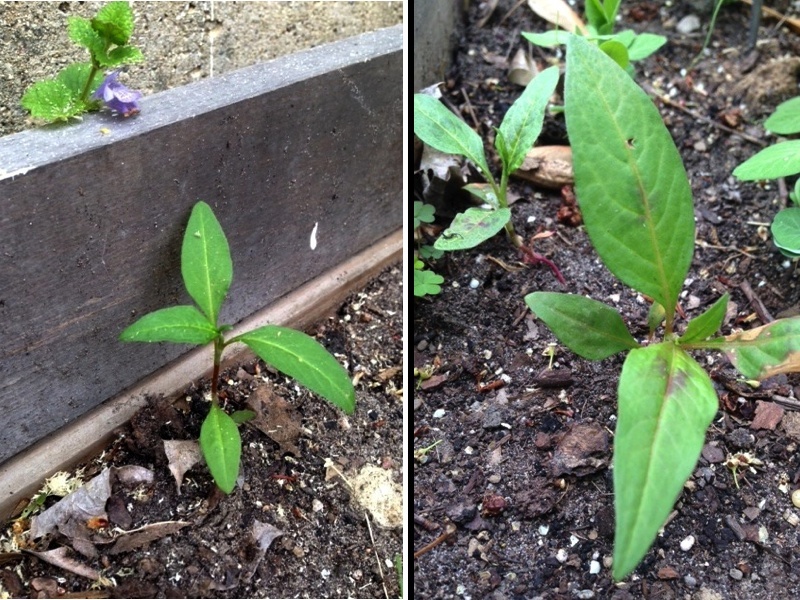 Here are the final two of our “mystery plants” found in the garden. 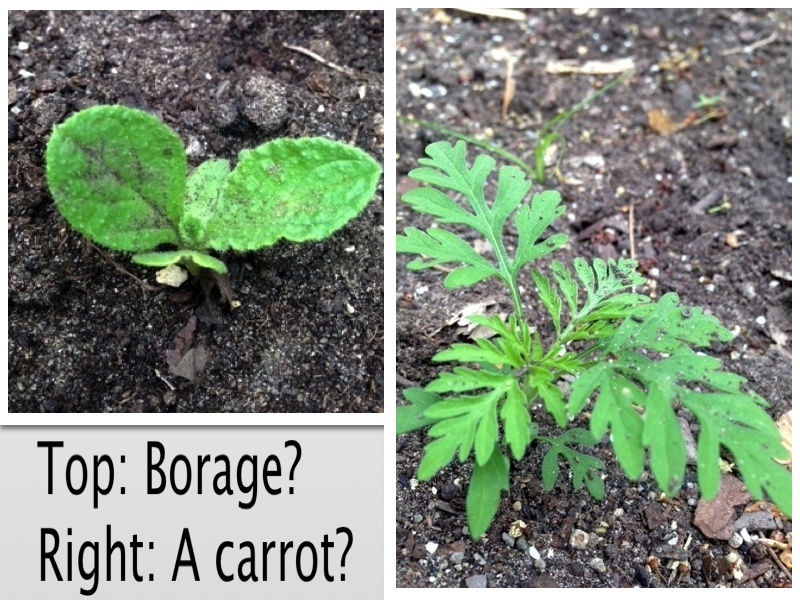 I really have no idea what either of these are but with some searching I have a best guess — borage and carrots. The borage makes sense because we did have that in several beds so it’s very likely a seed or two were dropped somewhere else. But carrots? We didn’t grow any carrots last year, although we are trying them this year. It’s quite possible that I cut of an end of carrot, tossed it in the compost bin and never thought of it again until this spring. If that really is what happened — again, we’ll never know — I think that’s amazing! It shows you how resilient plants can be, and if we get a few random plants from the compost, well, that’s fine by me. Our “pepper” plants growing in beds that didn’t have peppers last year. Hmmm…. I pulled a couple of these doing some weeding around our garden beds, but then I realized these didn’t look like the typical weeds that pop up in our garden. They had a distinct leaf shape and looked like pepper plants. While I’m not really sure if that’s what they are, we’re going to let them grow up a bit and see. In the one bed it makes sense — that’s where we had the majority of our pepper plants last year. There are even two growing in a pot with one of our transplanted herbs, which didn’t survive. That one also makes sense because we had a couple peppers in that bed as well. The one that is a bit baffling is where we currently have snow peas and will have squash later this year. We had our tomatoes and basil there last season. So how did a pepper plant get there? I have a couple theories, but we’ll never really know. Last week when I finally decided to get myself out of bed, I walked sleepy-eyed toward the stairs and looked out the window, as is typical of every morning. To my surprise, there were two large deer just hanging out in our neighbor’s yard. It’s not that we haven’t seen deer in our neighborhood — we actually see them fairly often, sometimes just walking down the middle of the street. They bolted not even a minute after I woke up and jumped over the fence to go … well, wherever they went. It actually made me think of Tripod/Bruce who used to come around a lot. We haven’t seen him in a while, so I hope he’s OK.
After grabbing my cup of coffee, I walked into our office to check my email and on the way to my desk I noticed a big, fat rabbit hanging out in our backyard. He (or she) was happily chewing away at our grass. Fat rabbit chewing on our grass. We’ve never seen one this big before in our yard. Luckily though, it didn’t get to any of our vegetables and everything looked fine when I went outside to check later. All of our plants are doing really well, especially the broccoli, which last year got chewed by slugs and cabbage butterfly larvae. I was a bit surprised there weren’t more than a couple holes in the leaves and it makes me think the garlic we have planted next to it and in two other beds are doing a fantastic job keeping our garden safe. The rabbit eventually hopped back into our woods (really, just a patch of honeysuckle) and disappeared. It stayed for a while and provided a great morning show for these two. You know something big is happening outside when they’re this close together (they get along fine, but aren’t the best of friends). 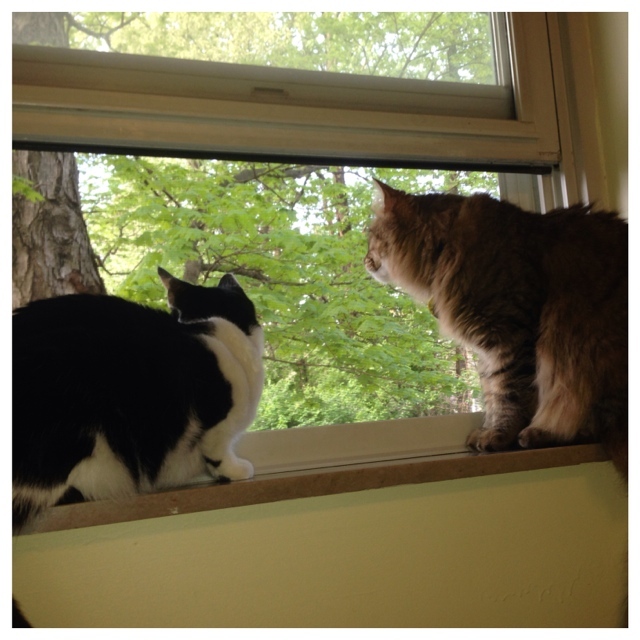 Meera, left, and Rajah watching the rabbit. We are getting used to seeing (and hearing) all sorts of wildlife, but it is still strange sometimes, especially living in city limits. When I was checking on the garden last week, I noticed something that looked of place. It was too big to be a weed, but the leaves didn’t look familiar. I let it go and a few days later “it” actually turned out to be six separate plants, all bunched together. Last year we had cucumbers, radishes and peppers in that bed, along with some borage and nasturtium. But these leaves didn’t look like any of those. After searching for seedling pictures of everything we grew last year, I think I stumbled upon an answer. Not positive, but we think this is a Brandywine tomato plant. It’s hard to see, but it looks like suckers growing in between the stem. This “plant” is actually six different ones. They look like Brandywine tomatoes to us. If that’s the case, I’m thrilled. However, we showed the picture to another gardener and they thought it was a potato, but we didn’t grow any potatoes last year. Either way, we’ll let them grow a little bigger until we transplant them to a different bed or to large pots. Since we put everything in the ground, there’s not much to report and most of it seems to be doing well. I think the rain and warm, but not too hot, temperatures helped the plants along. I keep waiting for the garlic to sprout its scapes, but so far it hasn’t happened yet. The four elephant garlic that survived are huge! They come all the way up to my hip, and I can’t imagine how big these bulbs will be, but we’re excited to find out! We’re also discovering some mystery plants, and I’ll share those pictures later. If they are what I think then we’re going to be stocked on seedlings this year!